Passenger traffic continued to grow at the Kingdom`s three international airports last year, pushing full-year passenger numbers above 10 million for the first time, according to figures from Cambodia Airports, the French-owned company operating them. 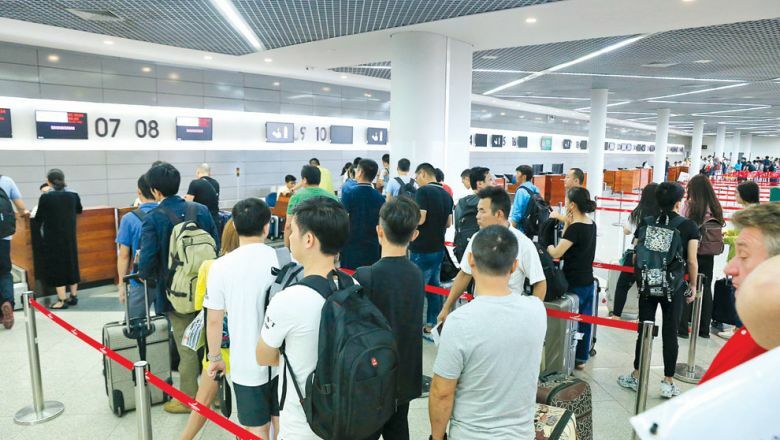 The combined number of passengers passing through Phnom Penh International Airport, Siem Reap International Airport and Sihanoukville International Airport between January and December last year totalled 10.5 million. This represents a 20 per cent increase over the same period in 2017. Cambodia Airports communications and public relations director Khek Norinda on Monday said an annual growth rate above 20 per cent is satisfactory, and reflective of Cambodia`s strong connectivity with many other international airports. "The attractiveness of Cambodia as a destination for leisure and business was the key driver for air traffic demand. It is also the result of our strategy for route development and for connecting our three airports to more destinations," he said. According to Cambodia Airports` figures, Sihanoukville International Airport saw the biggest increase in passenger traffic, with its passenger numbers growing 93 per cent last year to 651,000. Phnom Penh International Airport remains the Kingdom`s busiest and maintained a high growth rate last year, receiving a total of 5.4 million passengers, an increase of 28 per cent compared to 2017. Siem Reap International Airport saw a modest 6.4 per cent year-on-year increase last year with passengers amounting to 4.48 million. Home to the world-renowned Angkor Archaeological Park, Norinda said the country`s tourism stakeholders are looking into why Siem Reap hasn`t experienced significant growth, in particular from Japanese, Korean and Western tourists. According to Norinda, strategies promoting Cambodia`s coastal areas have paid off, with Sihanoukville now a top tourist destination, especially for visitors from China. Cambodia Airports` figures also revealed that there was a combined total of 104,805 aircraft movements - the number of take-offs and landings - at the three airports last year. Phnom Penh handled 52,217 of those, Siem Reap 44,314 and Sihanoukville 8,274.